Born in 1954, Jan Drozdowicz graduated from the Academy of Music in Poznań, where he studied in Prof. Romuald Sroczyński’s class of organ, and from Poznań University, where he defended his thesis in Prof. Z. Ziembiński’s department at the Faculty of Law. Having served organ making apprenticeship to the Belgian company Stephan Schumacher, in 1981 Jan Drozdowicz started his own organ-making enterprise, and subsequently received the master organ builder title. He is professionally active both at home and abroad, where he collaborates with several organ-making companies from Germany, Belgium and Switzerland. 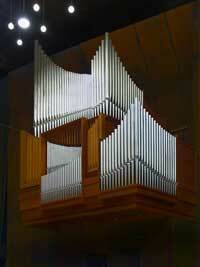 Promoter of organ music concerts, he is active in the area of recording organ music. An important part of Jan Drozdowicz’s activity is work performed in Poznań and the Wielkopolska region. This includes construction of new organs, as well as alterations, restorations and repairs to already existing instruments.